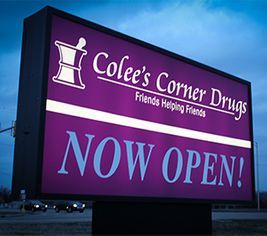 Colee's Corner Drug is a locally-owned, independent pharmacy located in Forsyth, IL. This store opened in 2014, and is a sister location to Dale's Southlake Pharmacy in Decatur. Colee's is located at the corner of U.S. 51 & Weaver Road in Forsyth. Colee's also specializes in special medication packaging options. If you or a loved one are looking to remain independent while maintaining your medication, we can help. We offer weekly medication caddies, and monthly blister packages. These medication organizers break down daily doses into morning, noon, evening and bedtime doses for patients. These medication caddies are helpful for caregivers who are responsible for making sure their loved one takes their medicine on the correct time and day. Call us today and let our knowledgable staff help you with all of your healthcare questions.